The coach of the Shohoku High basketball team, and one of the best ones in Japan. Even the coaches of other teams call him "Anzai-sensei" with respect. His calm and collected attitude contrasts with the temper he had in the past, when he was nicknameed "White-Haired Devil" as a demanding college coach. A talented player, Ryuji Yazawa, trained under him and was eyed with high regard by Anzai. However, Yazawa was unhappy about Anzai's tough training for him (especially the repetitive and strenuous basic technique training), and against the Coach's wish, left Japan to play in the USA, where he thought he would have better opportunities to show his talent. 5 years passed without any news, other than an unaddressed video tape showing Yazawa playing in a team, whose players had virtually no concepts of teamwork. One day Anzai learned from the press that Yazawa died in a high-speed head-on car collision, reportedly under drug influence. While visiting Yazawa's grave, Yazawa's mother gave Anzai a letter written 4 years prior, which Yazawa never had the courage to post back. In the letter, Yazawa expressed profound regret about his rebellious decision to leave, and the depression from his experience in the unsupportive American college basketball career. Anzai grieved deeply for the loss of Yazawa and resigned from college basketball coaching ever since. This also changed Anzai's former strict attitude to his now mild temper, for which he is now known as the "White-Haired Buddha." 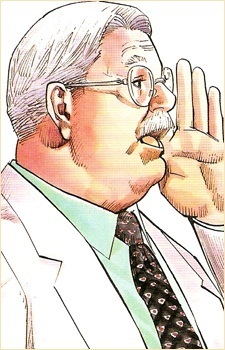 Sakuragi always calls Coach Anzai "Oyaji" (old man) and has the habit of jiggling his fat when hyped, which makes the others - Mitsui in particular - mad at him, as this is considered disrespectful. Anzai, however, appears to tolerate this and has not reprimanded Sakuragi for his behavior. However, Anzai did punish the four players (Mitsui, Miyagi, Sakuragi and Rukawa) involved in the fight against Mitsui's gang, by initially benching them during the first interhigh tournament match against Miuradai High School. However behind such an impassible demeanor is a brilliant strategist, who always knows how to turn the tide of a match for his team. Anzai like Haruko Akagi, realized Sakuragi's potential early on and decided to make him a starter even though some of his basketball skills were not yet par. Recognizing that shooting was Sakuragi's weakness, he made him make 20,000 baskets in a week to get ready for the national tournament. Anzai is also very charismatic and able to inspire his players to greater heights, as evidenced before the match against Sannoh, where he managed to bring down the insecurity within Miyagi, Mitsui and, to a lesser extent, Sakuragi. Although they were directly recruited by Coach Moichi Taoka of Ryonan, both Mitsui and Ryota turned him down, citing Anzai's presence at Shohoku as the primary factor. Mitsui respects Anzai the most, and once put a picture of him on the bench and prayed to it when Anzai was unable to come to the inter-high Shohoku-Ryonan match due to heart attack.